This review first appeared in July 2016 on HifiKnights.com. By request of the manufacturer and permission of the author, it is here syndicated to reach a broader audience. As is customary for our own reviews, the writer's signature at review's end shows an e-mail address should you have questions or wish to send feedback. All images contained in this piece are the property of Dawid Grzyb - Ed. Vincent Brient is the man behind TotalDAC, a French company known for their unique D/A converters. His use a very specific topology said to sound very good. When opportunity to review one came about, the decision was made in a heartbeat. What the courier delivered was a d1-integral-headphone. This is a streamer, DAC and headphone amplifier all in one box. Enjoy. These days the audio world is full of possibilities for anyone deep into digital music. Things became extremely sophisticated over the years. That's obviously a good thing to pick and choose from particularly in this genre. From an engineering perspective, the road to achieving the goal of converting signal from digital to analogue can be most varied. Practice shows how different approaches achieve various results. Before we go further, there's an important thing to remember. The overall sound quality of any audio product depends heavily on the engineer's skill of connecting the various pieces of the puzzle. Here the human touch is crucial. What parts are used is important of course but a great cook can create a grand meal with literally nothing in the fridge. To some this is common knowledge but it had to be pointed out once again. That's because our hobby is filled with individuals who get deeply invested in a design based just on its topology. On many levels that even makes sense. For instance, if one is after a class A/B power amplifier to drive a pair of difficult speakers, it's very probable that a 300B SET becomes a no-go. Conversely someone in search of a low-power pure class A amp will discard heavyweight A/B brutes by design. The same goes for speakers. Open baffle fanatics won't take small two-way bass-reflex affairs under consideration and vice versa. These scenarios are understandable. It's quite different with DACs though. Many people focus primarily on the conversion method, be it a single Sigma-Delta chip, several of these stacked, vintage R2R via PCM1704 or TDA1543, chipless, FPGA upsampling with a simple low-pass filter and so forth. But there's so much more to it like the execution of the power supply, digital receivers, current-to-voltage conversion, output stage etc. Each of these can be implemented in many different ways and is partly responsible for the final outcome. Many highly regarded engineers insist that the power supply is of greater importance than the choice of conversion silicon for example. Moving right along, it's easy to see why enthusiasts with big coin avoid Sigma-Delta chips. These are so often used in very affordable products to not seem kosher enough. A narrow price frame in fact is the main limiting factor which seriously reduces an engineer's options. He can't go after a fancy power supply, FPGA code writing or tubes, all of which may lead to an outcome well below the spectacular but to the minds of many, ΣΔ chips are the only culprits. Odd, ain't it? Personal experience tells me that exotic converters like Chord's Hugo can indeed sound amazing. Yet at the same time, we have marvelous products like the Sigma-Delta AURALiC Vega or the far more affordable iFi Audio iDSD. Moving up, quite a few high-end manufacturers use conventional chips with great success. Think Fore Audio DAISy 1 or COS Engineering D1. Besides, I believe that commercial chips are still improving. To conclude, instead of bashing a certain topology, it's safer to remain open-minded and to shift the focus from single parts to overall design skill. This review is about a product made by an individual who has followed his own path for quite a while, since 2011 to be precise, but for more than a decade already he's also worked as a telecom engineer. His TotalDAC d1-integral-headphone is a very unique machine with many twists. And no, it's not ΣΔ so their naysayers may read on without fear. Build. 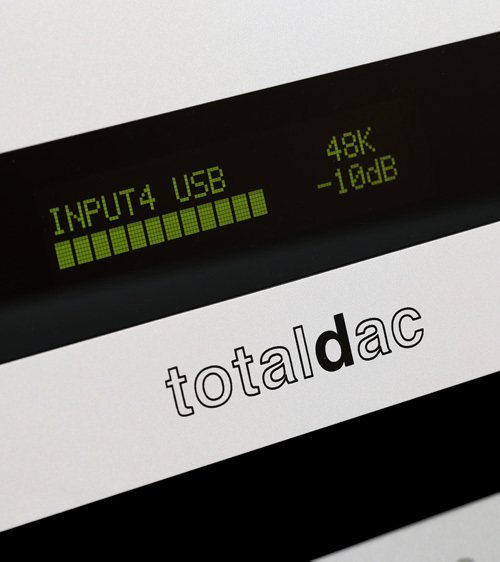 Every TotalDAC model looks exactly the same. It has the same chassis, front panel, display and power supply. The question is whether one gets one box or several. For instance, the d1-twelve DAC is a three-piece affair. Add three power supplies for each main box and one needs a fair amount of space. That's the price to pay to get TotalDAC's best. Our review subject is different. It's a d1-single-mk2 DAC with two things added - a headphone output and a d1-server. The former is a standard d1-single-mk2 feature whilst the latter may be bought as a completely separate product. Functionally, the d1-integral-headphone serves as D/A converter, preamplifier, Roon-ready streamer and headphone amplifier. To think of this as a complete headphone system which requires merely a transport to be operational is as correct as it gets. Just plug it into a NAS-fed router or laptop, add cans and you're off. The other scenario involves executing the first part in the same fashion but following it with a hifi rig not headphones. The TotalDAC d1-integral-headphone is quite small. It measures 110 x 360 x 290mm and weighs 6.5kg; nothing crazy. A separate toroidal transformer power supply (65 x 112 x 180mm) comes as a part of the package. The machine won't work without it. This outboard solution improves sound quality. The umbilical connecting both pieces is long enough to place the PSU out of sight. Dandy. Moving on, the main machine is nicely made and looks much better than in the pictures. Subjectively, I found Vincent's aesthetic very appealing. His trapezoid shape makes it recognizable, different and at the same time strangely universal. The main chassis is made of brushed aluminium finished in matte black whereas the front can be solid PMMA in black or silver aluminium. The latter adds €350. The rear is glossy steel and looks nice as well.